It is definitely Angela Kinsey Week — her new Clairol ads have started to air, she appeared on ‘The Tonight Show with Conan O’Brien’ last night, and the pièce de résistance — Angela stopped by the OfficeTally Chat Room tonight! Angela answered fan questions, gave us an update on what she’s doing this summer, and we even had a group hug. A fun time was had by all. We were thrilled that Rainn Wilson came to chat with us earlier tonight. Rainn discusses his public feud with Sockington, his favorite TV shows, and what he still gets nervous about. 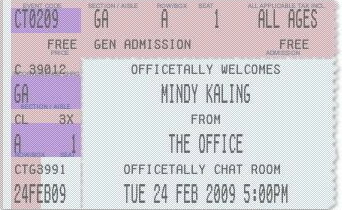 We were super happy to welcome Mindy Kaling to the OfficeTally Chat Room tonight! Mindy graciously answered fan questions for a full hour — on everything from the letter Pam reads to Michael in ‘Lecture Circuit,’ to her favorite Oscar night fashion, to who’s hottest in the writers’ room. And of course it wouldn’t be an OfficeTally chat without a few spoilers thrown in! Thanks, Mindy, for an awesome evening! 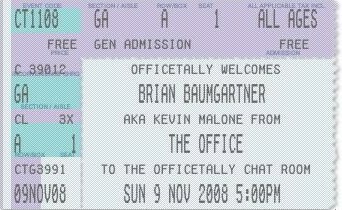 It was awesome to chat with The Office’s Brian Baumgartner this afternoon in the OfficeTally Chat Room. Brian discussed what it was like working with Stephen Merchant and Amy Ryan, why he is ‘King of the Internet,’ and what food he’ll never be able to eat again, because of The Office. Thank you, Brian, for keeping the LOLs coming at a steady pace! We were thrilled to welcome The Office’s Angela Kinsey to the OfficeTally Chat Room tonight! Here is a transcript of the event. 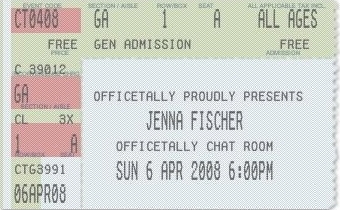 The Office’s Jenna Fischer paid a special visit to the OfficeTally Chat Room tonight! All in all, Jenna answered questions for over an hour, keeping more than 50 Tallyheads in rapt attention. Thank you so much, Jenna, for stopping by! Many thanks to The Office writers Lee Eisenberg and Gene Stupnitsky for visiting the OfficeTally Chat Room tonight! Oh sure, there were some disparaging remarks made about our last OTCR guests, and the conversation turned raunchy around minute 33, but what’s an OfficeTally Chat without a little insanity? Full transcript available after the jump. Thank you, Lee and Gene! We miss you guys and we miss the show! P.S. 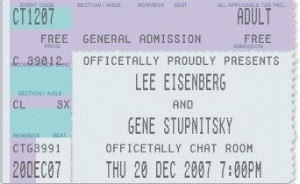 In the following transcript, “leeeisenberg” refers to both Lee and Gene. They are one. 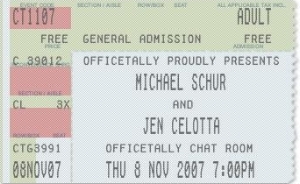 It was an absolute thrill to welcome The Office’s co-executive producers and writers extraordinaire Michael Schur and Jen Celotta into the OfficeTally Chat Room tonight! Aside from Mike mistaking Parker for a guy and Jen trying to type replies on a toaster, the chat went very well. They answered questions about the strike and the future of the show. I talked to Mike afterwards, and he sounded totally pumped about the whole experience. Another chat is a definite possibility for the near future. A full transcript of the chat after the jump. A few tiny spoilerish tidbits included.